As Assistant Sports Editor of The Daily Telegraph for many years, Martin Smith seems to have an affinity towards this broadsheet newspaper having previously compiled another book, Not In My Day, Sir, for Aurum Press which dealt with cricket letters written to the paper. This latest venture is similar in style but deals with the lives of departed cricketers whose obituaries appeared in The Daily Telegraph. Eighty-four well-known names from the game are recognised during the book’s 235 pages. Not just cricketers but a media person and scorer also appear. In the past, obituaries for The Daily Telegraph were the domain of Jim Swanton and his work is well chronicled within the pages. Styles have changed and indeed there are some perhaps surprises amongst the writers here. Although the cream of The Daily Telegraph’s writers are featured, the reader is also treated to the writing skills of former prime minister, Sir John Major, and West Indian fast bowler, Colin Croft, paying tribute to West Indian spin bowler, Alf Valentine. Some are unattributed but, in most cases, the articles pay tribute to the, at the time the obituaries were written, recently deceased and, in the main, show the joy that their lives gave. There is a broad spectrum of the deceased: a lot died through natural causes, some through illness, others through accidents and a couple of suicides. In most cases, the authors tell their views as they saw them so maybe some of the articles, if read closely, may not appear to be quite as gushing as might be expected. Or maybe I am just plain sentimental after the recent passing of people. The topic is something a little bit different and should make a very welcome addition into the pantheon of cricket literature. 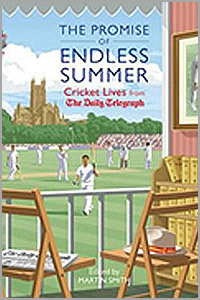 I certainly learned a bit more about some of those written about so, if you fancy reading the lives of the cricketing greats including Sir Donald Bradman and Denis Compton to legendary scorer, Bill Frindall, this is the book to buy.